Karen fears for Keanu's safety and demands some answers. EastEnders has revealed a first look at new characters Iqra and Habiba Ahmed arriving on Albert Square. 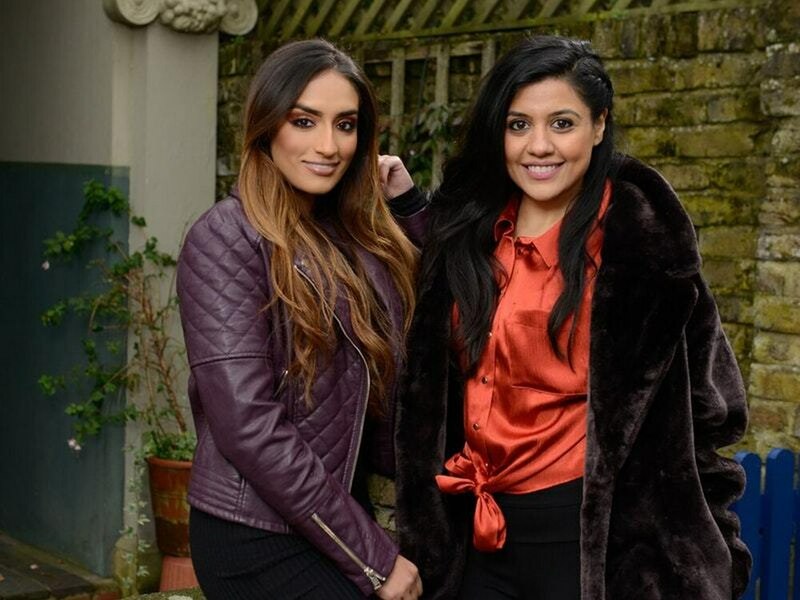 The mischievous pair are the nieces of Masood Ahmed and will be new regulars for the show, shaking up life in Walford from the very start. When Iqra (Priya Davdra) and Habiba (Rukku Nahar) first arrive, they have their sights firmly set on running the Walford East restaurant – especially with Masood about to head off to Australia for Nancy and Tamwar's wedding. Masood is intrigued to spot his family members on the Square and rightly suspects that there's more to their arrival than just ambitions for the restaurant. What really brings the pair to Walford? EastEnders airs these scenes on Tuesday, February 19 at 7.30pm on BBC One. Dot has been up all night and isn’t up to attending Doctor Legg’s funeral. Her anguish deepens when she suspects that the Walford locals are not paying enough respect to his memory. When Rainie turns up at Dot’s to offer her help, Sonia’s not impressed to see her. At the chapel, Sonia steps in for an absent Dot and reads the eulogy for Doctor Legg. The wake at The Vic is well attended. Dot is able to pop in and is pleased to see so many people there, including two former Albert Square residents Lofty Holloway and Mary Smith! The three former neighbours reminisce about Doctor Legg as everyone prepares to bid him a final farewell. Masood’s nieces Iqra and Habiba make a big entrance to Albert Square when they cause a commotion at the tube station! The pair have arrived after hearing about Masood’s planned departure to Australia, as they want to get their hands on Walford East. Masood is surprised to see the girls and they quickly cover, insisting they will look after the restaurant while he’s away. But is there something they’re hiding? Masood is suspicious the pair are up to no good. He’s concerned when they dismiss the agency staff, telling them they’re not needed. Can Habiba and Iqra set his mind at rest before he leaves for the wedding? Karen is pressuring Sharon to find out what’s going on with Keanu in Spain. When Sharon fails to get anything out of Phil she makes a mysterious phone call. Who has she called for help? There’s a shock in store for Sharon later in the day when an old face turns up on the doorstep. It’s Lofty. Sharon is still under pressure from Karen, who is desperate for information on Keanu. Sharon tries again with Phil but doesn’t get any further than before. Grasping at straws, Sharon asks Louise to try and find out for her. But she’s shocked when Louise asks Phil to tell her how Keanu is, then tells Phil she’s pregnant! Unsurprisingly, Phil is furious but is she telling the truth? Iqra and Habiba are on the case trying to drum up business for Walford East. After approaching punters in The Vic, the girls get on the wrong side of the Slaters. When Habiba hears Mick having a go at Kat for not doing her job properly, however, Habiba is furious on Kat’s behalf. To teach Mick a lesson she knocks her drink all over Mick. Then the fire alarm goes off. As everyone leaves the pub, Iqra sees Habiba sneaking out of a side door. What is she up to? Tiffany is shaken when she gets a frosty reception from Evie’s gang, who then target Bernadette. Jumping to her estranged friend’s defence, Tiffany has a go at them. Bernadette offers Tiffany an olive branch and the pair soon make firm friends again. When Tiff finds out that Bernadette wants to try online dating, she is encouraging. Also, Rainie’s frustrated when Max ignores her calls and she and Stuart compete to look after Dot. Rainie is furious when she finds out that Max left Iqra and Habiba in charge but is Iqra making it up? Feeling ostracised by Max, Rainie gets drunk in the Vic and finds a guy to flirt with. Habiba is confident that she and Iqra can make a go of things at Walford East, shooting down Iqra’s niggling doubts that they’re not doing the right thing. When Iqra wonders if they should call home Habiba warns her not to. But why are the sisters so reluctant to contact their parents? Iqra’s annoyed when Habiba asks Ruby to help them out with a promotional event. When Iqra sees the pair shaking hands on the deal, she worries to Habiba that they won’t be able to afford to pay her. Habiba, however, insists that she’s got enough cash. But where did it come from? Stacey tries to find a job for Ruby. Mitch and Bailey plan a surprise for Karen to take her mind off Keanu. why does max buy masood share of beales, to be in partnership with ian? i thought mary's daughter was her wife/partner whose the daddy, ian? I don't think we know who the father is. She turned up on the Square with her baby. Max and Jack and the kids are gone to France, where is Mel, gone away too now Hunter is in prison?